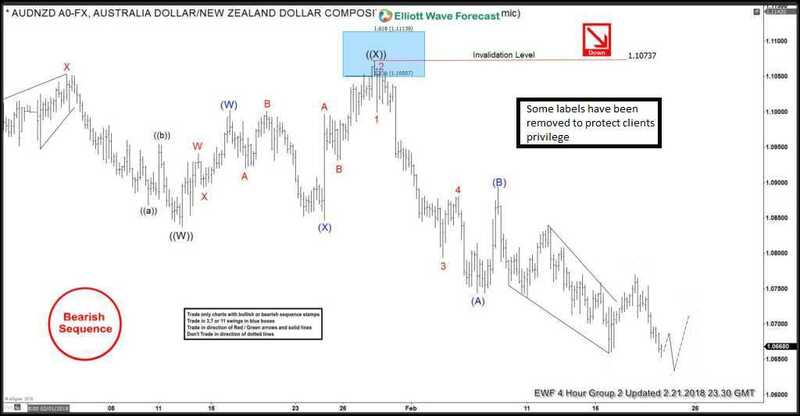 In this Technical blog, we are going to take a quick look at the past Elliott wave chart performance of AUDNZD. Which we presented to our clients. We are going to explain the structure and the forecast. 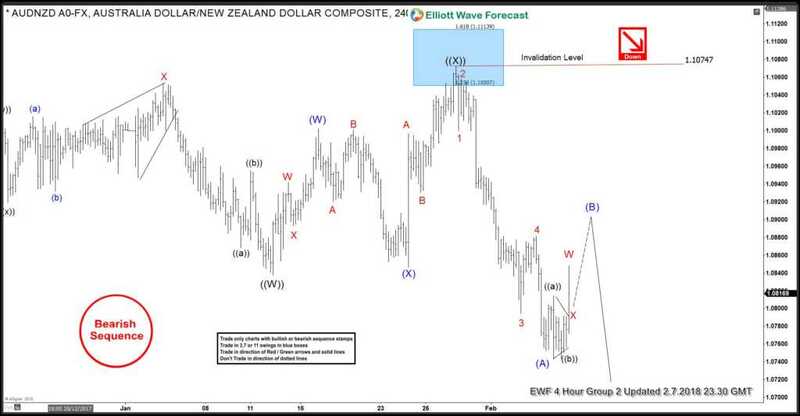 As our members know, we were pointing out that AUDNZD is having lower low bearish sequence from October 24.2017 peak. We advised our members to avoid buying it and keep selling the bounces in 3, 7 or 11 swings as the mentioned cycle from the October 24.2017 peak was incomplete to the downside. Above is the 4hr updated Chart from February 07.2018, in which the pair was showing the incomplete 5 swings bearish sequence to the downside from 10.24.2017 peak. And the pair was expected to see more downside within that as far as bounces fail below January 29.2018 peak (1.1074). It is also important to note that, in the above Chart, we can see that there is a red arrow to indicate that the trend is to the downside, the bearish Sequence mark to maintain the sequence is also bearish. 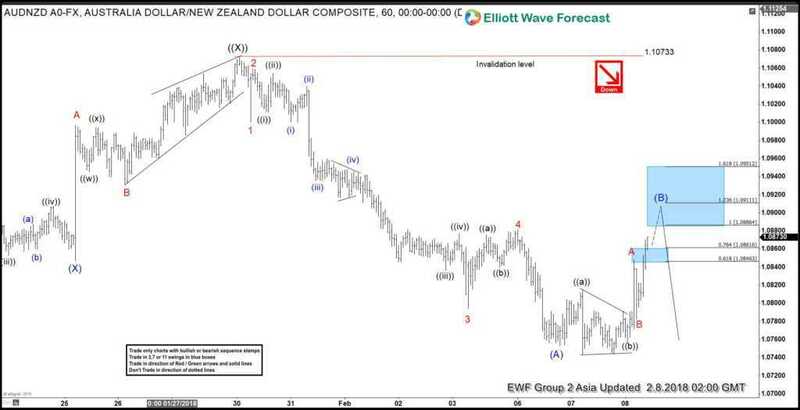 Moreover, the decline from 1/29 peak (1.1074) also unfolded in 5 waves Elliott wave sequence, which is also a motive sequence thus suggest that the pair should fail below 1/29 peak (1.1074) for another 5 waves lower at least into the direction of the first leg. So our strategy was to sell the intermediate wave (B) bounce in a sequence of 3, 7 or 11 swings against the pivot from 1/29 peak (1.10733) for further downside extension. In the above 4 Hour Chart, the pair already showing lower low sequence from the Intermediate wave (B) bounce thus confirmed the next extension lower in Intermediate wave (C ) and shorts from 1.0886 should already be in a risk free position. Keep in mind that the market is dynamic and the view could change in the meantime. Success in trading requires proper risk and money management as well as an understanding of Elliott Wave theory, cycle analysis, and correlation. We have developed a very good trading strategy that defines the entry. Stop loss and take profit levels with high accuracy and allows you to take a risk-free position, shortly after taking it by protecting your wallet. 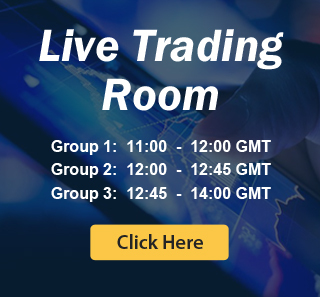 If you want to learn all about it and become a professional trader then try EWF and trade our Blue Boxes with a special deal. Click here to get 30% discount on all monthly plans.